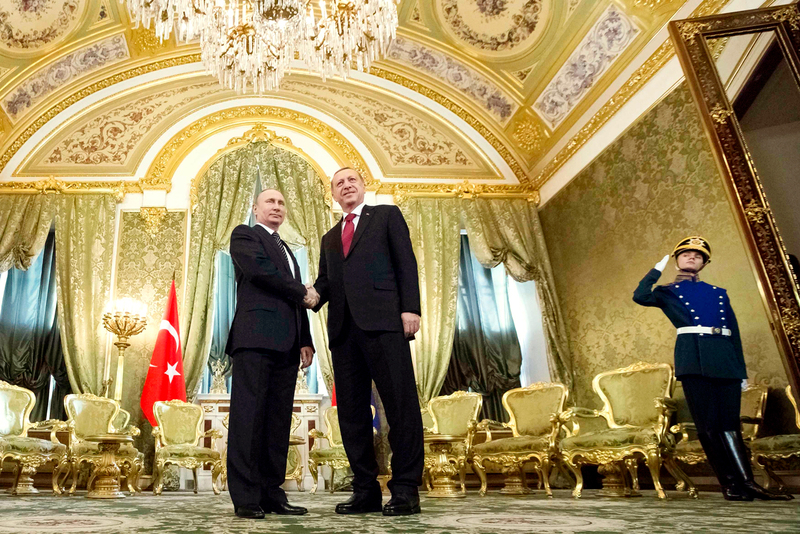 Have Putin and Erdogan managed to strike a deal? Russian President Vladimir Putin (L) shakes hands with Tayyip Erdogan during a meeting at the Kremlin in Moscow, Russia, March 10, 2017. Following the meeting in Moscow with the Turkish leader, the Kremlin held a session of the Russian Security Council to discuss Syria, "taking into account" the outcome of the talks. Both the Russian and Turkish sides said they were satisfied with the agreements reached in Moscow on March 10. "I think we can abandon the words 'normalization of relations' because we think we have already passed that stage," said Turkey’s leader, Recep Tayyip Erdogan. Vladimir Putin confirmed that the two countries "had restored an intensive political dialogue" because other mechanisms of bilateral cooperation have been established. Relations between the two countries hit a low in November 2015 when the Turkish Air Force shot down a Russian bomber near the Syrian-Turkish border. Last summer, however, Turkey took the initiative to restore relations between Ankara and Moscow, which subsequently began to return to normal. At the Moscow meeting Vladimir Putin announced that the ban on Turkish construction companies in Russia had been lifted, and also promised to further liberalize the travel visa regime with Turkey that was introduced shortly after the downing of the Russian bomber. Putin not only mentioned Turkish citizens’ visits to Russia but also Russians traveling to Turkey, which has been dubbed "Russia’s health resort" because of the large number of Russians who visit that country’s Black Sea resorts. Putin said that "the tourist flow to Turkey from Russia ... has been a very important component of our life in recent years." In an unexpected glimpse into his private life, the Russian president recalled that before he moved to Moscow in the late 1990s he had often holidayed in Turkey. "And these holidays left me with very fond memories and warm feelings," he said. The leaders also confirmed their readiness to go forward with the most important Russian-Turkish economic projects. Putin said that Russia’s gas giant, Gazprom, is ready to start work on the Turkish Stream gas pipeline on the seabed of the Black Sea, and the nuclear energy corporation, Rosatom, is ready to start building the Akkuyu nuclear power plant. In addition, Ankara and Moscow agreed to set up a joint investment fund of up to $1 billion. Without a doubt, Syria was one of the main topics, which is evident from a statement by Kremlin spokesman Dmitry Peskov that the session of the Russian Security Council following the talks included "an exchange of views on the issue of Syrian settlement, which, among other things, took into account today's talks with the Turkish side." Experts believe that the main Syria-related issue discussed by the presidents, and then by the Russian Security Council, concerned Russia's relations with Syrian Kurds. After the talks in the Kremlin, Erdogan made statements regarding Kurds that were not commented on by his Russian counterpart. The Turkish leader said the Kurdish organizations that are considered terrorists by Ankara should cease their work in Russia. A year ago, the world's first representative office of Syrian Kurdistan opened in Russia. Moscow should not "lose face"
Semyon Bagdasarov, director of the Center for Middle East and Central Asian Studies, said it’s obvious what Erdogan wants: he takes issue with Syrian Kurds because of their close links to Turkish Kurds, whom Ankara accuses of separatism. Syrian Kurds have strong political representation and combat-ready military groups. The expert said that Russia should not meet Ankara's demands and withdraw its support from the Kurds, even though they get the bulk of assistance not from Moscow, but from the West. By exchanging Syrian Kurds for a gas pipeline and a nuclear power plant, Russia "can lose face," Bagdasarov warned. Irina Zvyagelskaya, professor at the Department of Oriental Studies at the Moscow State Institute of International Relations, said that discussions about the status of the Kurds will continue. Russia will not give up its position whereby the Kurds should be represented as an independent political force at the intra-Syrian talks in Geneva, something that Ankara objects to. The expert also pointed out that, in addition to the Kurdish problem, another issue that may have been discussed by the two leaders and at the Russian Security Council session is the possibility of supplying Ankara with S-400 air defense systems. According to media reports, this issue was on the agenda for the Putin-Erdogan meeting.